This flexible little mic gives much better results than its modest price suggests. Photo: Mike CameronWhile large-diaphragm mics attract the most attention, there are instrument recording tasks for which small-diaphragm models are much better suited. 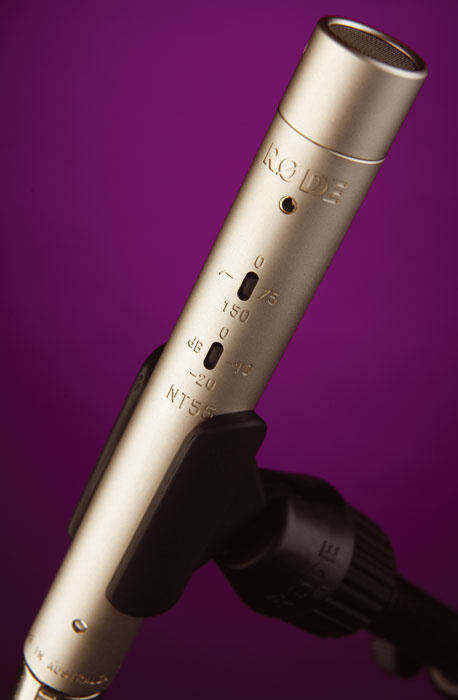 Rode have built on the success of their previous small-diaphragm models with the NT55, which provides plenty of flexibility by offering both omni and cardioid capsules. The heads simply unscrew, so changing them over takes moments. The whole kit is supplied in a small tin box with a sculpted foam lining, which means you won't have to find space for yet another bulky camera case! When a capsule is fitted, the mic measures around 145 x 20mm and an RM5 stand clip is included in the box, complete with thread adaptor so it will fit standard US and European mic stands. Although a shockmount would have been nice, its exclusion is understandable, as it would probably have pushed the price up. Recessed into the satin-nickel-finished body are two slide-switches, for setting an internal pad (0, -10 or -20dB) and one of three roll-off curves (-75, -150 and flat). Surface-mount components are used to achieve the necessary component density, and this approach to the design also offers the advantage of reducing noise and interference, as the length of interconnecting conductors is kept to a minimum. The output is balanced, on the usual XLR, and, because these are true capacitor capsules that require a polarising voltage, the microphones need a source of 48V phantom power to operate. The cardioid capsule, which uses a gold-sputtered Mylar diaphragm and offers a 20Hz to 20kHz response (-3dB), has seen active service before in the Rode NT5 (reviewed in SOS August 2002). The omni capsule has a similar technical specification — other than, of course, its directional pattern. According to Rode, the microphone is intended for studio, radio, film and TV recording, live sound, theatre, surround recording and similar applications. Self-noise is 15dB SPL EIN, which is very respectable for a small-diaphragm microphone, and the sensitivity is a healthy 16mV/Pa. The dynamic range works out at 121dB but, even though the mic can handle spectacularly loud SPLs, it is perfectly happy recording quieter instruments, where the low noise-floor is a real advantage. This makes this mic as appropriate a choice for acoustic guitar as it is for drum overheads. With the cardioid capsule fitted, the NT55 behaves much like the NT5, delivering a neutral sound with the bare minimum of noise. There's a gentle roll-off below 100Hz, to help counter the proximity effect, and a very gentle presence hump, centred at around 8kHz, to give the sound a bit of top-end air. This capsule works well for just about any type of acoustic instrument but, where it is possible to use it, I tend to prefer the more open sound of the omni capsule, as positioning seems a little less critical than for its cardioid counterpart (this is, of course, a function of microphone physics rather than anything unique or unusual about Rode's design). In omni mode, the low end isn't deliberately rolled off unless you switch in the filter, and the presence peak is a little more pronounced. Alongside more general tests, I've done some acoustic guitar recording (with both nylon-string and steel-string guitars) using this mic in this mode as part of a new project involving a couple of high-profile virtuoso players, and the results were excellent. I used an SE Reflexion filter behind the NT55, to minimise the amount of room reflections getting into the back of the mic, and was rewarded by a well-focused, very natural sound, with plenty of definition. I found that the NT55 gave me really high-quality results, and I was genuinely surprised when I found that the cost of the complete kit was under £200. While you may be able to buy microphones that are technically better in specific areas, the tangible differences in performance are quite small and the differences in cost very large — a case of diminishing returns. You can also buy cheaper microphones, but you tend to pay in terms of quality. You'll probably detect a hint of enthusiasm here, so you won't be surprised to learn that the NT55 is my current microphone of choice for acoustic guitar and small percussion, and I'm very much looking forward to trying it on other projects. If you want truly professional performance from a limited budget, the NT55 offers an excellent performance to price ratio — so why compromise? Though there is plenty of choice for small condensers in this price range, there are relatively few alternatives that include both capsules, so I've also included competitively-priced omni and cardioid-only models. If you're considering the NT55, you might want to check out: the SE3 (cardioid only) and SE2A (cardioid, hypercardioid and omni capsules included) by SE Electronics; the AT 3031 (cardioid) and AT 3032 (omni) by Audio-Technica; the AKG C451B (cardioid, but with various other capsules available); the Sontronics STC1 (cardioid); and M-Audio's Pulsar (cardioid). Achieves good subjective results on a wide range of instruments. The NT55 is perhaps the most highly specified small-diaphragm microphone in its price range and its subjective performance is every bit as good as its paper specification. Having a choice of capsules really adds to its flexibility. +44 (0) 208 962 5080. +44 (0) 208 962 5050.